Col Solare Winery-Cabernet Sauvignon-Merlot-Cabernet Franc-Columbia Valley-Washington State-2007-$29.99-A nose of dark fruits and spice, dark garnet in color. A medium to full bodied smooth Bordeaux blend with blackberry, currants, cherry, with layers of coffee, chocolate and spice on finish. A very good and highly enjoyable blend and a steal at under $30, has years of life left. The winery is a collaboration between Tuscany’s Marchesi Antinori and Washington State’s Chateau Ste. Michelle. RP-93 WS-91 WE-94 CR-93 Good with meats, chicken, pasta. Etude Wines-GBR-Merlot-Malbec-Grace Benoist Ranch-Estate-Carneros-Napa-California-2007-14.9% Alcohol-$37.49-A classic nose of dark fruit and spice, dark black garnet in color. A full bodied red blend, thought it was a Cab at first, with black cherry, blueberry, kirsch, toffee and chocolate and spice on elegant finish. A delicious wine, decant for a hour or so, still years left to enjoy. RP-92 WS-91 WE-88 CR-93 Good with meats, chicken, pasta. Buoncristiani Family Winery-O.P.C.-Cabernet Sauvignon-Syrah-Merlot-Malbec-Hyde, Stagecoach, Caldwell Vineyards-Napa Valley-California-2005-14.8% Alcohol-$37.50-A nose of dark fruits and spice, dark purple in color. A full bodied kitchen sink blend with blackberry, currants, cherry, and chocolate with spice on finish. Decant for a few hours, was layered and delicious, still has years of life left. WE-95 CR-93 Good with steak, chicken, pasta. Bremer Family Winery-Claret-Cabernet Sauvignon-Merlot-Cabernet Franc-Petit Verdot-Howell Mountain-Napa Valley-California-2003-14.6% Alcohol-$24.99-A nose of a classic Bordeaux with dark fruit and cigar and spice, dark garnet in color. 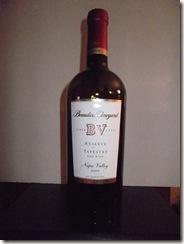 A full bodied Bordeaux styled red with blackberry, cigar box, licorice and chocolate, smooth spicy finish, good stuff. Gets better as a few hour decant, was a steal at this price. One of my son’s picks from my cellar for his 24th B-Day dinner. NR CR-92 Good with steak, chicken, pasta. Napa Redwoods Estate-Yates Family Vineyard-Alden Perry Reserve-Cabernet Sauvignon-Merlot-Cabernet Franc-Mount Veeder-Napa Valley-California-2008-14.5% Alcohol-$47.50-A nose of dark fruits and spice, dark garnet in color. A medium to full bodied Bordeaux blend, with blackberry, black currants, rich and layered, dark chocolate and spice on long finish. A delicious bottle of wine. WE-92 CR-92 Good with steak, chicken, pasta. Flora Springs-Trilogy-Cabernet Sauvignon-Merlot-Cabernet Franc-Petit Verdot-Napa Valley California-2006-14.4% Alcohol-$35.81-A nose of dark fruits, tobacco and spice, dark purple in color. A medium to full bodied Bordeaux blend, with blackberries, black currants, tar and cocoa with a long spiced finish. I am not sure what WS and WE were trying but it was not this wine…delicious and classic. RP-90 WS-78 WE-84 CR-92 Good with meats, chicken, pasta. 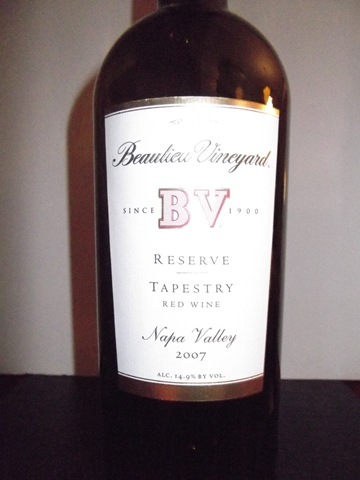 Beaulieu Vineyard-Tapestry-R eserve-Cabernet Sauvignon-Merlot-Cabernet Franc-Malbec-Petit Verdot-Napa Valley-California-2007-14.9% Alcohol-$29.99-A nose of dark fruit and spice, dark purple in color. A young, but tight kitchen sink blend, full bodied, with blackberry, currants, dark chocolate with licorice and spice notes, decant now but buy more and save for a few years before drinking to get it’s best. RP-91 WS-93 WE-92 CR-91 Good with steak, chicken, pasta. 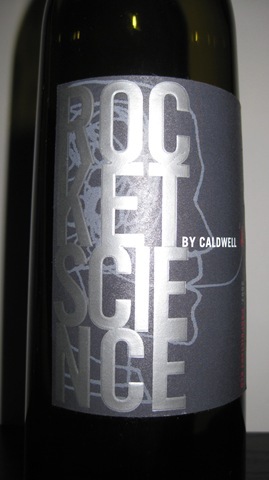 Caldwell Vineyard-Rocket Science-Proprietary Red-Napa Valley-California-2007-14.9% Alcohol-$34.98-A nose of dark fruit, dark amber in color. A full bodied Bordeaux blend, blackberry, black cherries, spice and some vanilla, not as perfect as the 2006 but very good with one of the coolest bottles in the industry. I was lucky to spend some time with John Caldwell in November at a tasting in his Cave, a fun place to visit. NR CR-91 Good with steak, chicken, pasta. Flora Springs-Trilogy-Cabernet Sauvignon-Merlot-Petit Verdot-Napa Valley-California-14.2% Alcohol-$42.99-A nose of dark fruits and spice, dark garnet in color. 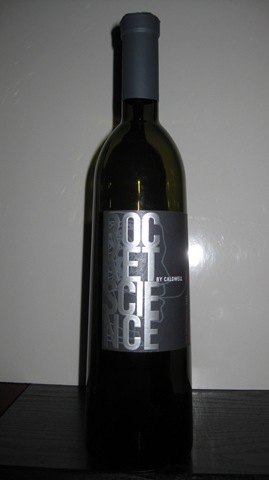 A medium to full bodied Bordeaux blend, with blackberries, currants, licorice and spice on long finish. Consistent year in year out, decant. RP-93 WE-91 CR-91 Good with meats, chicken, pasta. Alpha Omega-Proprietary Red-Cabernet Sauvignon-Merlot-Petit Verdot-Cabernet Franc-Napa Valley-2006-14.9% Alcohol-$36.33-A nose of dark fruits and spice, dark garnet in color. A full bodied Bordeaux blend, with black currant, cassis, milk chocolate, smooth with a spiced finish. Not sure what WS was tasting. RP-90 WS-85 WE-95 CR-91 Good with steak, chicken, pasta. Behrens & Hitchcock Winery-Ode To Picasso-Cabernet Sauvignon-Merlot-Syrah-Napa Valley-2000-? Alcohol-$65.00-A nose of dark fruit and spice, dark garnet in color. A full bodied Bordeaux red blend, with blackberry, dark chocolate, tar and spices. A very good wine, cool label and very heavy bottle. RP-92-94 CR-90 Good with steak, chicken, pasta. Three Saints-Sixty-Seven-Cabernet Sauvignon-Cabernet Franc-Merlot-Syrah-Petit Verdot-Malbec-Happy Canyon of Santa Barbara-2007-14.5% Alcohol-$17.99-A nose of dark fruits and spice, dark purple in color. A full bodied kitchen sink blend, with blackberry, cherry, some chocolate and smoky spice on finish. An interesting and very good red blend. NR CR-90 Good with meats, chicken, pasta.